For September 1999 . . . 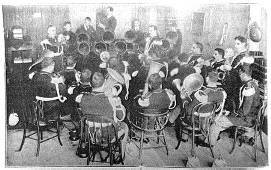 This month: An early recording of John Philip Sousa's United States Marine Band made in Washington, DC  a Mexican dance, La Media Noche, from 1891. Announcement "The following Mexican dance entitled 'La Media Noche', as played by the United States Marine Band. Record taken for the Columbia Phonograph Company of Washington, DC." In the earliest days of the sound recording industry, both the recordings and the records generally had a bit more "personality" than in later years. The announcement: Being able to put a nickel in a slot and hear a disembodied band playing was quite a thrill for many years, particularly from about 1889-1893. A recording beginning with a full and clear announcement was often a big part of the fun. In later years, as the industry broadened and matured, announcements typically became more matter-of-fact and even a bit sterile. But early on, long and distinctive announcements were common  although none quite as florid as those of the Columbia Phonograph Company. During this era, Columbia's announcers gave each cylinder an individual announcement. That is, instead of bellowing out the announcement to all the phonographs at once, the announcer would, one at a time, go to each machine, start the phonograph, announce the recording, then stop the phonograph. After each record was announced, the phonographs then would all be started simultaneously to take the performance. Imagine how ticked-off the announcer would be if somebody fouled-up the take! Recordings with individual announcements will usually have a "thunking" sound after the announcement where the phonograph was turned off and on. In this recording of La Media Noche you can hear two faint low-pitch (80Hz) thunks, 1/2 second apart, after the announcement. 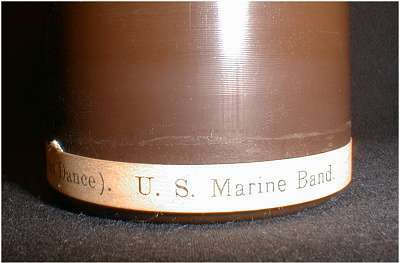 The United States Marine Band recording at the Columbia Phonograph Company, Washington, DC (ca. 1891). Click here or on the above image to learn more about early recording sessions. 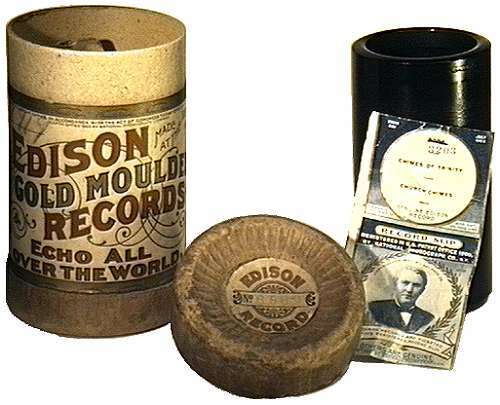 The labelling: Years before wax cylinders were available with labelling stamped on the end (circa 1904), record manufacturers would commonly use record slips to identify selections. But in the earlier years from about 1890 to 1894, some companies experimented with printed paper rings pasted onto cylinder ends. Even more primitive, was the use of a paper strip (circa 1890-91). Easily ripped or pulled off, an intact paper strip is rare indeed. Click here or on the above image to see a close-up of La Media Noche's paper strip. Although the United States Marine Band was, at the time of this recording, under the direction of John Philip Sousa he apparently did not attend any of the recording sessions: Sousa was famous for despising "canned music" (a term he coined).